While we've got nothing personal against shoji screens, there's just something about them that screams, "I really couldn't think of any other way to separate my space". If you're looking for some more imaginative room divider ideas to create different living areas in a studio apartment or to section off a large room, we've compiled a list of options that are as useful as they are unique. Flip through our round-up for 8 interesting partitioning solutions that will help you divide and conquer. Take a tip from the repurposing gurus at TerraCycle and copy their plastic bottle partitions. You can use clear bottles if you want light to pass through your bottle wall or darker bottles if you prefer more privacy. Wouldn’t your friends simply faint with envy if they walked into your apartment to see a LEGO wall like this one divvying up your space? We give a lot of credit to the guys at Npire for patiently placing each toy brick to build their amazing room divider. A vertical garden room divider is a wonderful way to enliven a room with greenery while also creating different living areas. A modular plant wall like the one you see above is even better because it can be moved or rearranged whenever the need arises. Bookshelf room dividers are a popular option because they’re dual-purpose, but they also have the added benefit of privacy control. If the area you want to hide away is ultra-private like a bedroom, fill up your bookshelf to the max. If it’s not imperative that the view be obscured, leave a few spaces open to let more light pass through. 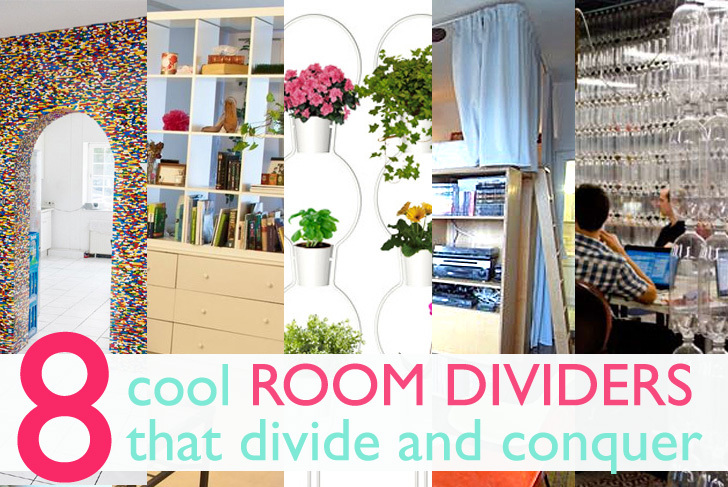 Room dividers don’t necessarily have to be on one plane. If you have a small studio with high ceilings, creating a lofted room like this Brooklyn couple did in their 460-sq-foot apartment can divide the area into three distinct rooms and maximize storage space. If you’re looking for a room divider that also creates extra storage, how about this diy walk-in closet idea from Ikea. The hanging curtain doubles as a fabric headboard for your bed! Sometimes you want to segment a room into separate zones without cutting off natural light. We saw a simple solution to this problem when we visited Michele Bertomen and David Boyle’s shipping container home in Brooklyn – a single pane of inexpensive coroplast. Boyle saved the piece from one of his contracting jobs, but similar materials can be found secondhand at places like Build It Green! NYC. Music lovers can take another tip from TerraCycle, and recycle their old records into a room divider that is music to our ears. Making the most out of your ceiling space to build upwards can really help you create more storage solutions actually! It looks like it is a bookcase room divider that is placed on a dresser. You can find some awesome ones here: http://www.hayneedle.com/accents-and-decor/room-dividers_bookcase_list_182779_4293173890 I love the bookcase style too! where can I get the white bookcase with drawers room divider? Plastic Bottle Room Divider Take a tip from the repurposing gurus at TerraCycle and copy their plastic bottle partitions. You can use clear bottles if you want light to pass through your bottle wall or darker bottles if you prefer more privacy. Your friends would simply faint with envy if they walked into your apartment to see a LEGO wall like this one divvying up your space. We give a lot of credit to the guys at Npire for patiently placing each toy brick to build their amazing room divider. Bookshelf room dividers are a popular option because they're dual-purpose, but they also have the added benefit of privacy control. If the area you want to hide away is ultra-private like a bedroom, fill up your bookshelf to the max. If it's not imperative that the view be obscured, leave a few spaces open to let more light pass through. Loft Room dividers don't necessarily have to be on one plane. If you have a small studio with high ceilings, creating a lofted room like this Brooklyn couple did in their 460-sq-foot apartment can divide the area into three distinct rooms and space. Room dividers don't necessarily have to be on one plane. If you have a small studio with high ceilings, creating a lofted room like this Brooklyn couple did in their 460-sq-foot apartment can divide the area into three distinct rooms and maximize storage space. DIY Walk-In Closet If you're looking for a room divider that also creates extra storage, how about this diy walk-in closet idea from Ikea. The hanging curtain doubles as a fabric headboard for your bed! If you're looking for a room divider that also creates extra storage, how about this diy walk-in closet idea from Ikea. The hanging curtain doubles as a fabric headboard for your bed! Sometimes you want to segment a room into separate zones without cutting off natural light. We saw a simple solution to this problem when we visited Michele Bertomen and David Boyle's shipping container home in Brooklyn - a single pane of inexpensive coroplast. Boyle saved the piece from one of his contracting jobs, but similar materials can be found secondhand at places like Build It Green! NYC. Records Music lovers can take another tip from TerraCycle, and recycle their old records into a room divider that is music to our ears.